Rocky Mountain River Tours maintains an enviable reputation on the Middle Fork of the Salmon. A common question from potential guests…“why choose Rocky?” Its true, all of the outfits on the Middle fork benefit from the amazing beauty of the Frank Church, the pristine waters of the Middle Fork and the magic that occurs from spending 6 days away from civilization with a small group of new friends. In the end its simple, three factors are at play. Middle Fork guides belong to an upper echelon in the guiding community. They have been tested by the high waters of Spring, the technical boating of August and all the variables that pop up while leading 24 experienced guests through the largest Wilderness in the US. The one thing that sets the Rocky crew apart from the competition is tenure. The current crew of Rocky guides has been working together for 10 seasons. They are well oiled machine when it comes to camp duties and on the on-water program. But the most distinguishing factor is their chemistry, like characters in a movie. 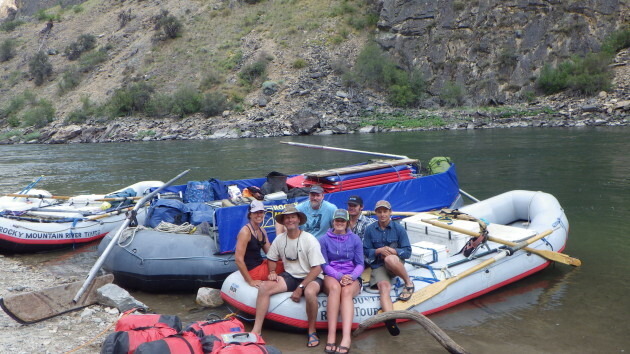 Each with unique strengths & personalities that combine to result in the best crew on the Middle Fork. Rocky pulls out all the stops when it comes to gear. New sleeping bags and pillows are purchased annually while large river mattresses, spacious new Mountain Hardware tents and comfortable chairs are the norm. Rocky provides a sanitary and private bathroom system with running water hand wash, solar showers and purified water. Excuse us while we brag. Rocky offers the best food on the river, period. This is not a new thing, its a tradition. Sheila Mills, Rocky founder is the genius behind the menu design while Rachel B. is the culinary artists that puts all the pieces together. The result is the most divers, fresh and healthy menu on the river. Sheila has made a career at designing dutch oven entrees and amazing deserts. She has published three Dutch-Oven cookbooks and continues to push the limits of what can be created in a riverside kitchen. The Rocky menu is so diverse and impressive that it has its own fan club. In an effort to keep the groupies happy we will be posting our 2013 recipe’s over the next few weeks. 5 Green Apples, chopped at the last minute & tossed in. Arrange pasta sheets in bottom of 3 DO’s. Spread each sheet with pesto. Break up sausage thinly & evenly on pesto. Put on layer of tomato slices. Put on another sheet of sfoglia. Top with sheet of pasta covered with sliced tomatoes and small amount of Parmesan. Bake till golden & bubbly. Mix well. Turn out onto floured surface and knead dough until soft and sticky about 5 minutes. Divide in half and roll out & punch into rounds the size of DO bottom. Let rise about 20 minutes and sprinkle with Parmesan, salt and pepper. With lightly oiled fingertips make indentations, about ½ inch deep and 1 inch apart all over dough. Bake with the lid covered with hot coals for about 20 minutes until golden.